As mentioned in my post, on August 30, there are some new models (soon to be old models) on the property. These cars are at the end of their usable life; roaming close to home in captive service between the HVL and a recycler fairly close by in San Antonio, TX. When that traffic goes away as it is expected to do, so will these cars. 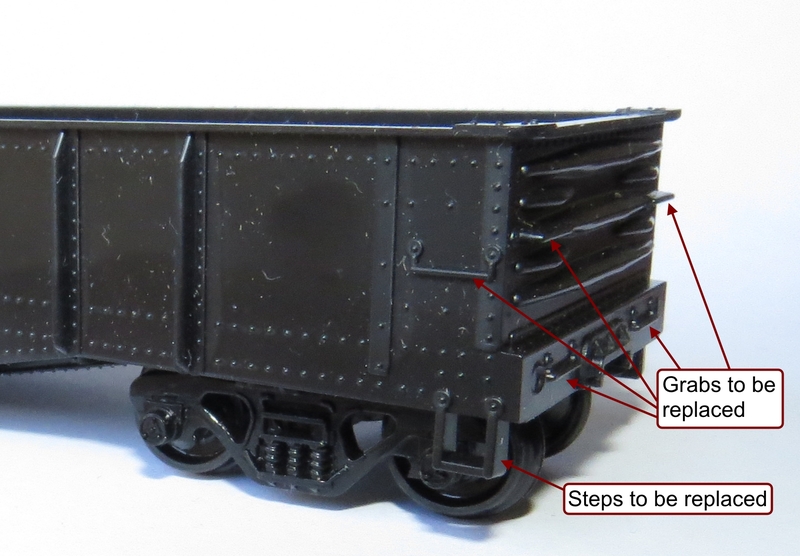 The paint scheme: boxcar red with HVL markings. There is no truck available from Kadee in the 70 ton solid bearing (I prefer to have the Metal Fully Sprung Equalised Trucks under all my freight cars). However, there is a I’ll be using the solid bearing Barber® S-2 70-Ton Trucks (Metal Fully Sprung Equalized Trucks) #504. While they are not the ideal truck that I’d like (there’s a 50 ton solid bearing unit available) I’m not fussed. The car itself is a complete fabrication – so we’re moving on. The basis of the work on the body is focused on updating the 1950’s era detailing. Replacing all the moulded grabs, and the appallingly over-scale steps will be the first step. Removing them is going to take some effort as I want to keep all of the external rivet detail (which is surprisingly nice). I’ll replace all of the grabs with either nickel-silver or brass wire grabs, and the steps will be bent up from some brass stock I have on hand. There’ll also be coupler lift bars applied. Finally, I’ll install a wooden floor and weather it. I may have to sand down the thickness of the wood siding that I have, and if this appears to be just too much effort I’ll use some styrene siding that will be perfect for the purpose and weather it to suit. I’ve not yet measured the weight of the car, but there is a lot of room in behind the sides to add weight should the car need it. Additional weight, if needed, will come from my supply of small fishing weights beaten to shape and ACC’d into place. For couplers I’ll be using Kadee’s #58 or #158 Whisker coupler. These are the standard coupler on the HVL. I’m looking at replicating a very worn out finish like that shown below in Dean Kobasiuk’s image of BCOL 9104, a 52′ 6″ car snapped in British Columbia in 2006. The HVL cars will not be patched but they will be weather-beaten, bent, battered, well used and literally just short of the scrap line themselves. In several shades of Boxcar red, depending on their last repaint, they’ll be heavily weathered. Keep an eye out for updates soon.